U.S. Federal Route 46 runs east-west across Northern New Jesery. It goes from Knowlton to Fort Lee. Info on U.S. Rt. 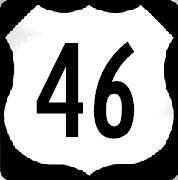 46 is broken downm by county below.